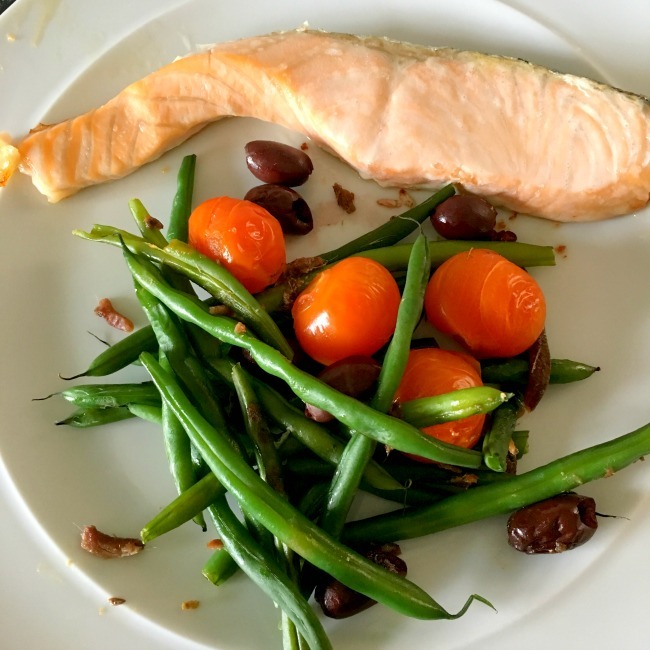 We first came across Salmon with Green Beans recipe in one of Jamie Oliver's Recipe books many years ago. We love the simplicity of Italian meals and the flavours. It is not Syn free, it has olives and anchovies. We eat it just as it is but if you would like a more substantial meal it is wonderful with boiled new potatoes or roasted sweet potatoes. Pop them into the preheated oven while you prepare the other vegetables. 100g Anchovies drained and patted dry with kitchen paper. Break into small pieces. Trim the stem ends from the green beans and boil for 6 -7 minutes, drain. Spray a baking tray with Fry Light and place the salmon on one end. On the other end place the other ingredients. Bake on the middle shelf for 12 - 14 minutes, depending on the thickness of the salmon fillet. This is a quick, delicious meal. The tomatoes are little packets of flavour. Because of the olives and anchovies the meal is 2 Syns. They are worth it for the extra flavour.